We love a bit of Chorizo in our house, my favourite is Chorizo stew on a cold, wintry night. So when I had some left over from a recent stew I wondered what to do with it. 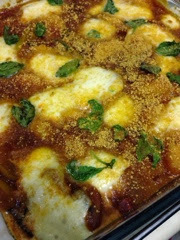 I threw a bit of gnocchi into the mix and came up with a chorizo and gnocchi bake. Sorry about the steamy picture but I really couldn't wait to eat it, so this is as good as it gets. Fry the onion, pepper, garlic and mushrooms lightly in a tablespoon of oil. Add your chorizo chunks and fry with other vegetables, letting the chorizo juice coat all in the pan. Once softened add the passata, handful of basil leaves and tomato paste and leave to simmer. I also added some chipotle chilli paste but again this is optional...we are just chilli lovers in our house. 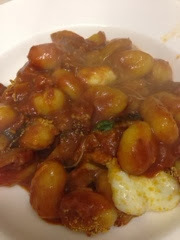 Now I cheated this time and used shop bought gnocchi but it's easy enough to make if you want to. Boil some water and add your gnocchi and wait until it all bobs to the surface (roughly around 3 mins). Once cooked, add to your pasta sauce, mix it all in and then put into a dish. Tear up your Mozerella and add to dish, throw on some basil leaves (and I added breadcrumbs). Put under the grill until the moz has melted and the dish is bubbling.